BIKE CATCHER is an advertising platform for new and used bikes, similar to AutoTrader Bikes but “with several key advantages”, according to director Robert Brown. “We’ll only be selling bikes,” he said, “and there will be no third-party advertising to distract buyers. “We’ve got a range of monthly packages aimed specifically at the trade. It’s very responsive and search-engine friendly, with good backlinks that will boost its page ranking.” Every advert on Bike Catcher includes a picture, description and price, and these are designed to centre on a smartphone screen, making them easier to read. Dealer packages start with Bronze (£20+VAT per month) with one admin log-in and ten adverts. Gold gives five admin log-ins (useful for dealers with a sales team) and up to 500 bikes, while the Platinum package (£95+VAT per month) offers unlimited numbers of adverts. All dealers get their own domain within the Bike Catcher site, which they can configure with their own colours and logos. The site went live in January, and a publicity campaign using social media and show presence starts this month. Bike Catcher is launching a major publicity campaign throughout March and April, so join now and have your Bike Catcher site ready and filled with bikes before the summer bustle hits. 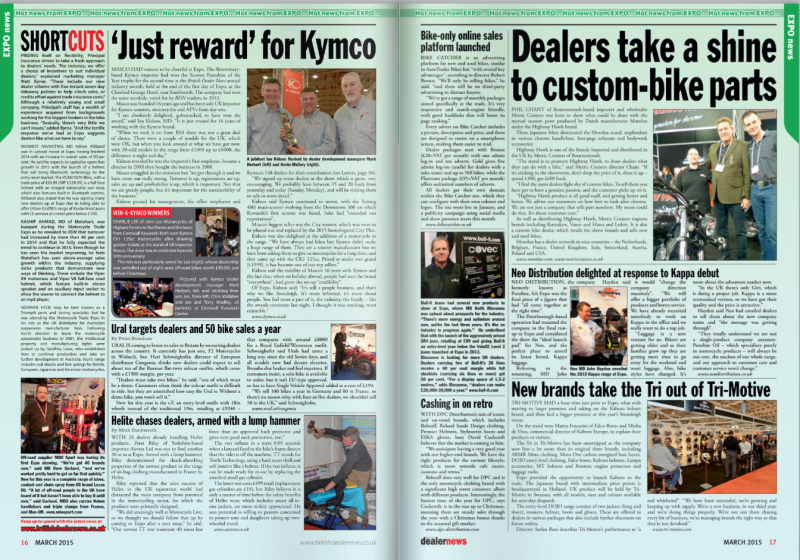 Many thanks to British Dealer News and the whole team at Expo, can't wait to be back next year.